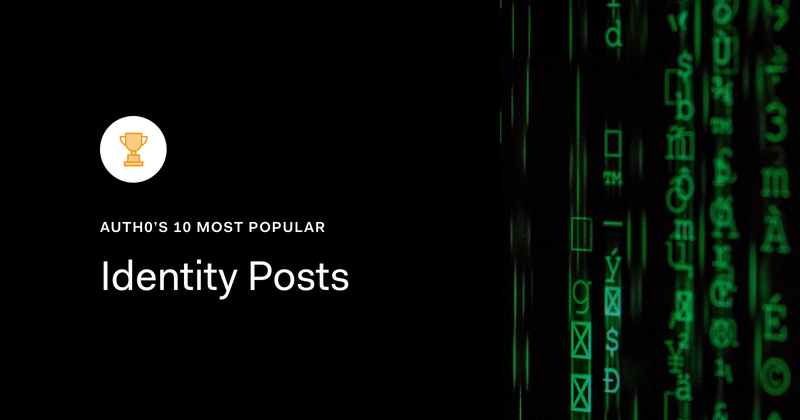 Our 10 most-popular identity posts in 2018 ranging from auth standards to web authentication. Time flies when you are having fun. It's December already and we are getting ready to wrap up this year. 2018 was a prolific year for the Auth0 blog: we published more than 200 posts (😱) where we tackled a diverse amount of topics: frontend and backend technologies, data breaches, GDPR, Cybersecurity, Company Culture, and of course, Identity. We believe looking back is key to look ahead. That is why this week, we are going to take a look back at the best and most impactful posts we have published in 2018. One article wouldn't be enough to review this amazing year, that's why we have decided to split this year in review into 3 parts: Developer Posts, Security Posts, and Identity Posts. Without much further ado, here's the roundup of our 10 most-popular Identity posts this year! The following posts are not listed in any particular order. In this overview, we will go over what open standards are and why they matter. We will also go over the top open standards used for identity including OAuth 2, OpenID Connect, JWT, and SAML. Open standards are important to understand but one can easily get overwhelmed by the technical specifications. In this post, we will take a look at the draft for the JWT Best Current Practices document. This document describes common pitfalls and attacks related to the use of JWTs, and how to implement mitigations against them. Read on! Web Authentication brings a stronger authentication mechanism to the masses by defining an API that both authenticators and web browsers can implement. Learn why Google, Paypal, Mozilla, and others back it up. Learn how to create a realistic project plan to have a good Identity Management project deployment. Learn how to plan for failures and changes in your identity project. Auth0 Principal Architect and Identity expert Vittorio Bertocci on why using OAuth2 scopes in every authorization scenario is not a good idea. Customer identity and management technology helps utilities reshape how they interact with users, improve their services, and tighten security. We are already preparing our content pipeline for 2019. Identity and digital transformation are key areas that will keep businesses evolving to tackle challenges around privacy, usability, growth, and sociopolitical policies. We are committed to keep our content relevant to these changes and offer effective solutions through our products and services. We'd like to take this opportunity to thank all of our readers for their consistent support and feedback. Is there anything that you'd like us to cover in 2019? Any particular identity topic or trend? Please let us know in the comments below or through social media (Twitter, LinkedIn). As always, you can subscribe to our newsletter to receive a weekly digest of our blog content.